The SFPD has arrested, cited, and released a driver for killing 78-year-old Isaak Berenzon as he crossed Sunset Boulevard at Yorba Street in the Outer Sunset Tuesday at about 11 a.m. This is the third known instance of the SFPD arresting a driver who killed a pedestrian, and wasn’t drunk or fleeing the scene, since New Year’s Eve. Previously, such drivers typically faced no legal penalties. Berenzon was walking east across Sunset Boulevard at Yorba Street in or near a crosswalk just before 11 a.m. when Ching, traveling south, hit him with a Toyota Corolla, police said. The road has three lanes in each direction, separated by a median. The crosswalk near where Berenzon was struck features warning lights that flash when a pedestrian hits a button to cross, but police have not said whether the lights were in use at the time of the crash. Berenzon was pronounced dead at the scene. Ching and her two passengers were taken to a hospital with non-life-threatening injuries. Berenzon’s death was the latest in a string of pedestrian fatalities in San Francisco. Twenty-one pedestrians were killed in the city in 2013, and another was fatally struck Jan. 7. The district attorney’s office filed a misdemeanor manslaughter charge in a recent case. Giampaolo Boschetti, 69, of San Francisco is awaiting trial for striking and killing 86-year-old Zhen Guang Ng of San Francisco in a crosswalk in the Crocker-Amazon neighborhood on New Year’s Eve day. Alex Bastian, a spokesman for the district attorney, said Ching’s case had not been presented to prosecutors. 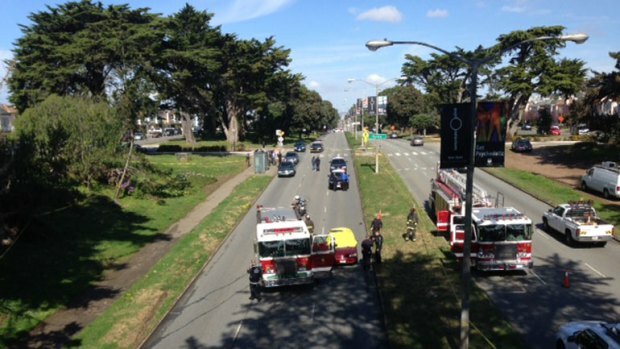 KTVU reported another pedestrian hit in the RIchmond at 3:30 today, life threatening injuries. It’s not nice to transfenestrate yourself through some poor person’s windshield. Someone needs to be doing a count of injuries/deaths post-#visionzero. I live in that area. California in particular is a traffic sewer leading to Park Presidio Boulevard and the access to the Golden Gate Bridge. The closer one gets to PPB and the bridge, the more people adopt a highway mentality. I can’t count the number of times I have been almost hit in the crosswalks at 9th and 10th and California. I had one driver look right through me and my dog crossing the street in the crosswalk and had him stop inches from me only after I started screaming a noxious obscenity laden death-rattle his way. I got the wave and shrug in return. (The US equivalent of SMIDSY). California between Arguello and 14th has no reason to be a 4-lane stroad. A Muni bus doesn’t even fit in the width one lane. California could be a prime candidate for a road diet with bike lanes.